^ "Dragon Quest VIII (US) - November 2005". LEVEL-5 International America. Retrieved May 31, 2012. ^ a b "DRAGON QUEST VIII on the App Store on iTunes". Square Enix. Retrieved May 29, 2014. ^ a b "DRAGON QUEST VIII - Android Apps on Google Play". Square Enix. Retrieved May 29, 2014. ^ a b "SQUARE ENIX will release DRAGON QUEST VIII for iOS and Android on December 12,　2013 in Japan (For Japan)" (in Japanese). Square Enix. 2013-12-02. Retrieved 2013-12-02. ^ "The New Year Brings a New World to Save When DRAGON QUEST VIII: Journey of the Cursed King Releases for Nintendo 3DS on Jan. 20". Business Wire. Nintendo of America, Inc. Retrieved 3 November 2016. ^ Yin-Poole, Wesley (May 13, 2015). "Dragon Quest 8 coming to Nintendo 3DS". Eurogamer. Retrieved May 13, 2015. ^ "DRAGON QUEST VIII: Journey of the Cursed King releases for Nintendo 3DS on January 20th 2017". Nintendo of Europe GmbH. Retrieved 3 November 2016. ^ "The New Year brings a new (DRAGON) quest, on 21st January 2017!". Nintendo Australia Pty. Ltd. Retrieved 4 November 2016. ^ a b Jenkins, David (April 23, 2009). "Square Enix Releases Tomb Raider, Dragon Quest Sales Data". Gamasutra. Retrieved April 23, 2009. ^ a b c d Onyett, Charles (May 19, 2005). "E3 2005: Interview with Yuji Horii". IGN. Retrieved June 1, 2009. ^ a b "Dragon Quest VIII at GameRankings.com". 2007. Retrieved October 13, 2007. ^ a b c d e f g h Kalata, Kurt (April 4, 2008). "The History of Dragon Quest". Gamasutra. Retrieved October 5, 2009. ^ a b c d e f Massamilla, Bethany (2005). "Dragon Quest VIII". Retrieved October 1, 2009. ^ a b Erikson, Brendon (December 13, 2006). "Dragon Quest VIII: Journey of the Cursed King". Archived from the original on 2009-01-14. Retrieved October 6, 2009. ^ a b Hartman, Ryan (April 20, 2006). 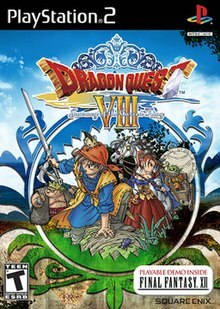 "Dragon Quest VIII Review at psxextreme.com". Archived from the original on January 10, 2016. Retrieved October 6, 2009. ^ a b 1up.com staff (November 29, 2004). "Dragon Quest VIII Launch Report". 1up.com. Archived from the original on October 19, 2012. Retrieved October 6, 2009. ^ a b c d e f g Dunham, Jeremy (November 16, 2005). "Dragon Quest VIII at IGN". IGN. Retrieved October 1, 2009. ^ a b c d Maragos, Nich (November 14, 2005). "Dragon Quest VIII Review". 1UP.com. Archived from the original on October 19, 2012. Retrieved October 1, 2009. ^ a b c Wilson, Mike (2005). "Dragon Quest VIII OST". RPGfan.com. Retrieved October 6, 2009. ^ Square Enix (2005). "Dragon Quest VIII Official Website". DragonQuest8.com. Archived from the original on September 20, 2008. Retrieved 2009-10-06. ^ Shonen Jump volume 3, issue 8, pg. 3. Viz Media. Retrieved October 8, 2009. ^ Cassidy, William (February 1, 2002). "The GameSpy Hall of Fame: Dragon Warrior". GameSpy. Archived from the original on 2011-06-03. Retrieved May 29, 2005. ^ Kennedy, Sam (2005-12-02). "Dragon Quest vs. America". 1up. Archived from the original on 2013-10-19. Retrieved 2011-06-16. ^ Parish, Jeremy (March 11, 2007). "GDC 2007: The Square-Enix Approach to Localization". 1UP.com. Archived from the original on October 23, 2012. Retrieved October 13, 2009. ^ Garrat, Patrick (January 16, 2006). "Mr Dragon Quest: The Cursed King". Eurogamer.com. Retrieved October 6, 2009. ^ a b Metacritic staff. "Dragon Quest VIII: Journey of the Cursed King for PlayStation 2 Reviews". Retrieved October 1, 2009. ^ a b Edge staff. Dragon Quest VIII: Journey of the Cursed King review. January 2005, p.78. ^ a b Parkin, Simon (December 22, 2005). "Dragon Quest VIII Review". Eurogamer. Retrieved October 1, 2009. ^ Famitsu (2005). "Famitsu scores". Archived from the original on August 22, 2008. Retrieved October 1, 2009. ^ Vassar, Darryl (Jan 10, 2006). "Dragon Quest VIII: Journey of the Cursed King for the PlayStation 2 Review". Retrieved October 1, 2009. ^ Gantayat, Anoop (November 15, 2005). "Dragon Quest Ships Triple Platinum". IGN. Retrieved November 16, 2005. ^ Sahdev, Ishaan (September 25, 2009). "Notable Japanese Game Developer Level-5". Gameguru.com. Retrieved December 11, 2009. ^ "Dragon Quest IX: About the Developers". Level-5. 2009-03-31. Retrieved 2012-02-26. ^ Niizumi, Hirohiko (January 30, 2006). "Four million Dragon Quest VIIIs shipped". GameSpot. Retrieved February 9, 2007. ^ Kohler, Chris (December 12, 2006). "Dragon Quest on DS: What It Means". Wired. Retrieved March 17, 2011. ^ Edge staff (November 30, 2005). "Inside Famitsu: Rogue Galaxy and More". Edge-Online.com. Retrieved May 28, 2009. ^ 1up.com staff (2005). "Best of E3 2005". 1UP.com. Archived from the original on June 5, 2011. Retrieved October 9, 2009. ^ GameSpy.com staff (2005). "Best of E3 2005". GameSpy. Archived from the original on 2005-06-01. Retrieved October 9, 2009. ^ "国民的RPGの底力を見た　『ドラクエVIII』が早くもトップセールス2位!! [ファミ通App]". famitsu.com. ^ Gaito, Eri (November 13, 2017). "Golden Joystick Awards 2017 Nominees". Best in Slot. Retrieved January 21, 2018. ^ Moyse, Chris (December 13, 2017). "Nominees for Destructoid's Best Portable Game of 2017". Destructoid. Retrieved January 21, 2018. ^ Makuch, Eddie (January 14, 2018). "Game Of The Year Nominees Announced For DICE Awards". GameSpot. Retrieved January 21, 2018. ^ "Dragon Warrior VII for PlayStation Reviews". Metacritic. Retrieved October 6, 2009. ^ 1up staff (November 15, 2005). "journey of the Cursed King". 1up.com. Archived from the original on October 19, 2012. Retrieved October 7, 2009. ^ Gantayat, Anoop (April 24, 2006). "Dragon Quest Yangus: Import Playtest". IGN.com. Retrieved May 28, 2009. ^ Alfonso, Andrew (May 1, 2006). "Dragon Quest Yangus". GameSpy.com. Archived from the original on 2006-07-01. Retrieved December 11, 2009. ^ Jenni (April 30, 2008). "How to get to Itadaki Street Portable". Siliconera.com. Retrieved May 28, 2009. ^ "Itadaki Street at Square-Enix.com". Square-enix.com. Retrieved December 11, 2009. ^ "Itadaki Street Coming to Wii in 2011". Archived from the original on July 18, 2012. Retrieved June 12, 2011. ^ "Dragon Quest IX full guest list revealed". Retrieved June 12, 2011. ^ Lummis, Michael; Owen, Michael. Dragon Quest IX: Sentinels of the Starry Skies (Brady Games Signature Series Guide). Brady Games. ISBN 0-7440-1238-4.